On 13 February 2018 the Centre for Arthurian Studies welcomed some very generous guests. Mr and Mrs Rawlinson of Wilmslow kindly donated a special set of plates in memory of Mrs Rawlinson’s father Prof. Roland C. Johnston. 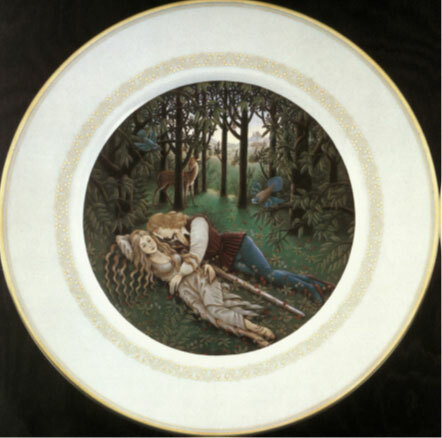 The plates, six in all, were privately commissioned by the International Arthurian Society to celebrate its 30th anniversary in 1979. The plates were crafted by Royal Worcester and are a limited edition, with each plate bearing an original work by the painter James Marsh. The images represent an important scene from Arthurian romance hand-decorated in 24 carat gold onto bone china, the finest of all porcelains. The original owner of the plates, Professor Roland C. Johnston, held the Chair of French Language and Literature at St Andrews University from 1948 to 1961. He was, alongside Professor Eugène Vinaver, a founding member of the International Arthurian Society in 1948. 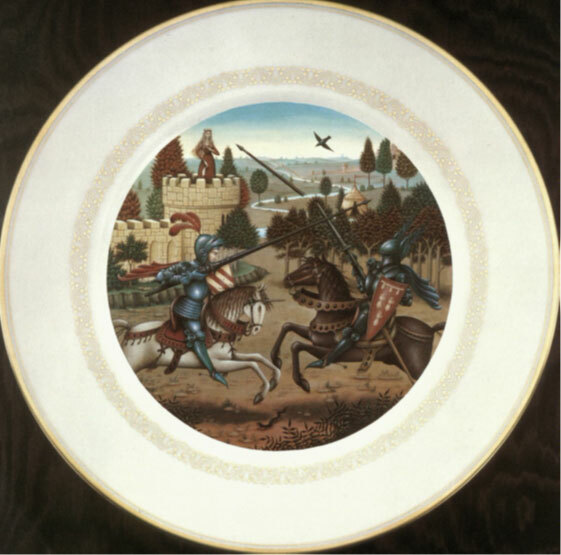 The plates were made as a strictly limited edition exclusively reserved for the International Arthurian Society members. 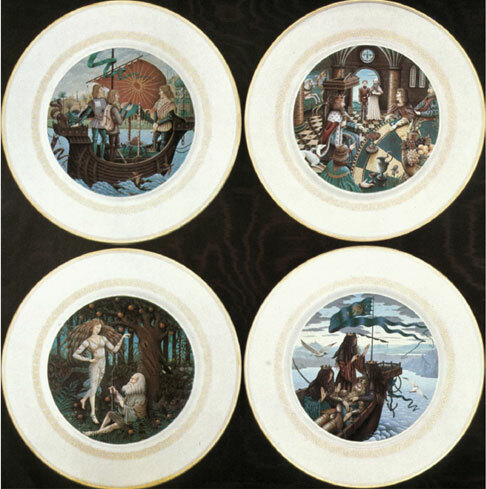 Each plate was sold at the price of £33, which also included special reference material describing each scene depicted on the plates, and indicating its place in the legend of King Arthur and the Knights of the Round Table by Professor Philippe Ménard, University of La Sorbonne, France. A certificate of authenticity was also included for each and every plate. The first image is of a scene where the knights Percival, Bohort, and Galahad, having achieved the Quest of the Grail, arrive on their miraculous ship at the fabled city off Saras. The dramatic introduction of the young Galahad to the Round Table, taking the seat that only he is worthy to occupy – ‘Siege Perilous’ for the first time. The poignant death of Arthur, his royal barge gliding from the shore to the mysterious Isle of Avalon from where, according to legend, he will one day return. The Centre for Arthurian Studies wish to thank Mr and Mrs Rawlinson for their kind donation. A depiction of the struggle of Good and Evil between Lancelot and evil knight Meleagant, who has abducted Queen GuinevereThe sales of the plates formed the foundation of what then became the Vinaver Trust, a charitable trust set up to support the publication of Arthurian scholarship. In its nearly 40 years of existence (since its foundation in 1981), the Vinaver Trust has been able to support the work of Arthurian scholars worldwide, with close to 90 books resulting from collaboration with international publishers. Following consultation among the committee members of the Vinaver Trust (of which Prof. Radulescu is currently a member, in her capacity ex officio as President of the British Branch of the International Arthurian Society) with its President Prof. Jane Taylor (formerly President of the IAS) and secretary Dr Geoffrey Bromiley (emeritus Durham University), the Archives of the Vinaver Trust will be established at the Centre for Arthurian Studies from late 2018. The conditions under which they will be available for consultation will follow the same guidelines as those stipulated for the Archives of the British Branch of IAS and of the IAS Archives, also lodged in the Bangor University Library and Archives under the Centre for Arthurian Studies.